Vincent Borg Bonaci born in Valletta on December 11, 1943, he became a complete Valletta player, winning honours in the minor and U-21 competitions. In 1962 he moved to St George's making his debut against Floriana (2-3) in the last league match. In 1963-64 Borg Bonaci returned to Valletta, making his league debut against Rabat FC (8-0) on May 5, 1964. During the season he was the understudy of legendary Tommy Taylor who guarded City's net in the club's hey-days (1958-1962). When Borg Bonaci arrived, Valletta were assembling a new side due to the emigration of their star players. 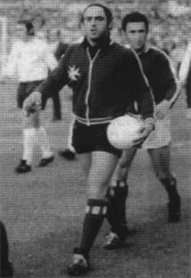 Between 1963 and 1966, Borg Bonaci had only occasional appearances for Valletta but between seasons 1966-67 and 1971-72 he became the regular goalkeeper. He played a total of 112 competitive matches. Between 1969 and 1972 he played for the national team in three friendly matches (home vs Austria 1-3, va Algeria home 1-1, away 0-1) another three matches in the 1972 European Championship (away vs Switzerland 0-5, away vs England 0-5 and away vs Greece 0-2) and in two 1974 World Cup qualifiers (home vs Hungary 0-2) and away vs Austria 0-4). He also guarded the Malta net in the friendly match at the Stadium - League XI vs Russia U-23 (0-2) in season 1971-72. Season 1968-69 was a memorable one for Borg Bonaci. He made sperb saves, suffered the least number of goals and went through 600 minutes without conceading a goal. He was a protagonist when the Lilywhites defeated Sliema Wanderers 3-1 and 2-1 to win the Cassar Cup in 1965-66 and 1968-69. These were the main honours he won with Valleta FC. The year 1969 was his best. he was as serious contender for the Footballer of the Year award and placed third in the Sportsman of theYear national contest, organised by 'The Sporting Star', among a total of 63 candidates.